Put up your guard Honda and Toyota, your Japanese little brother is growing up fast. Just like the existence of the manual transmission has been pushed to a state of uncertainty by buyers who shell out for automatics and don’t spend enough on manuals to recoup the development costs of a stick, sedans seem to be becoming the niche option. The latest first quarter reports covering January, February, and March of 2017 seem to confirm that consumers are gobbling up the steady stream of crossovers that automakers keep supplying and show no plans of slowing down to chew. One of the consequences of this trend can be seen in Motoring's latest report claiming that Mazda will be focusing on expanding options for its middle of the pack SUV, the CX-5. 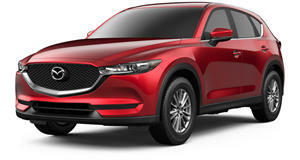 According to the Australian automotive news outlet, Mazda, which is gearing up for a rush of crazed customers once the new CX-5 is on sale, is in the final stages of developing a seven-seat version of the SUV that is likely to debut at the upcoming Los Angeles Auto Show in December. The CX-5 already sits in the market’s current hot spot as a mid-size crossover SUV, and while the new CX-5 is unlikely to encounter any problems moving from dealerships to customer driveways, it never hurts to have more variety in the family. If Mazda can find a way to fit all three rows inside of the current CX-5 without altering exterior dimensions or price too much, it’ll be a direct stab at the competition. Not many SUVs in the CX-5’s segment have three rows, so bringing the extra seating to price brackets this low would be troublesome for larger SUVs. Problematically, the success of a seven-seat CX-5 could hurt Mazda CX-9 sales, but it’s better to have that problem than to forgo sales to the competition. When speaking to Mazda about the possibility that the CX-9’s turbocharged 2.5-liter four-cylinder migrates down to the CX-5 to make a more powerful sporting version, Mazda promptly shot it down. No excuse was given, but the automaker did mention that we could expect such a car when the current CX-5 is replaced in 2021. Apparently a powerful mid-size SUV with seven seats that's cheaper than the CX-9 that would be too much for the range topper to handle, even with such a pretty face.